A senior associate has spent the past year undertaking comprehensive research and gathering contributions from the most senior members of the legal community to put together a practical guide to attaining balance. Julia Batchelor-Smith, a respected lawyer at Minter Ellison's Kiwi affiliate, Minter Ellison Rudd Watts, has recently completed her book: Balancing Work and Life: A Practical Guide for Lawyers, which is set to be released this Wednesday by LexisNexis. The lawyer and mum of two had previously been writing a regular column for Australasian Lawyer's sister magazine NZ Lawyer on the subject when the idea came about to take things a step further and write a book. At the time, she was getting ready to go on maternity leave for a year. “My overarching objective was to create a practical resource for practitioners and professionals navigating challenges in their daily lives,” Batchelor-Smith says. As well as providing constructive advice for lawyers on prioritising daily workload, dealing with stress, nurturing family and friends and striving for balance personally and professionally; five of the 30 chapters also explore issues relating to women in the law. The book was put together following extensive research from a wide range of sources, including professional body and academic reports as well as assessments of underlying statistics. Batchelor-Smith also included over 90 case studies from lawyers from Australia, NZ, the Middle East and the UK. 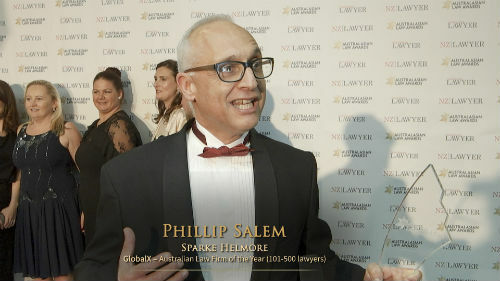 Contributions include those from senior members of the judiciary and the bar, general counsels and company secretaries of a number of major corporates, barristers sole, in-house lawyers, a number of directors and consultants, academics, a lawyer who is now an international bestselling author; alongside a broad range of partners, senior associates, senior solicitors and solicitors from major firms. One of the Australian contributors, Brook Dellavedova, is a principal at Australia's leading compensation and social justice law firm Maurice Blackburn Lawyers. She is one of the country's leading cartel class actions lawyers, having acted for claiments in many high profile cases. She's also got a particular interest in women's justice, and was the 2012 recipient of the Victorian Women Lawyers achievement award for General Excellence - Private Practice. Batchelor-Smith says that by including the real-life experiences of lawyers such as Dellavedova following each chapter, "the book really comes to life". But putting together such a comprehensive guide has also certainly had its own work/life challenges for the author - namely lack of time and sleep deprivation. But the good news is that she definitely thinks it’s entirely possible for legal professionals today to attain a satisfactory work/life balance. The key, the lawyer says, is carrying out an objective assessment of your specific circumstances to work out what is most important, and then structuring your life accordingly. One concept she explores in the book is work/life ‘blending’. This means that instead of fixating on achieving balance by stiffly demarcating work and home spheres, the focus is put on achieving one contented life where the lines are more fluid. In many respects this is a “far more realistic approach” in today’s society, Batchelor-Smith says. “It’s a highly personal exercise. The problem with lawyers is that we are competitive, Type-A people who like to compare ourselves to our peers. And that’s an inherently flawed methodology when it comes to working out what we really want in life. The senior associate says writing the book has been cathartic, and has crystalised her own personal thinking on a number of issues. That process has given her additional confidence in the choices that she and her husband have made for their family, she says. Plus, it definitely helps that the legal profession is already changing to support more of a work/life balance. “There’s been a discernible shift towards treating lawyers as individuals with differing needs and attributes - particularly in the large law firms,” Batchelor-Smith says. But in particular, she thinks the stark gender imbalance in the upper echelons of law firms has yet to be addressed adequately. One facet of the problem is the linear career path which rarely deviates and is very entrenched in law firm culture, she says. Balancing Work and Life: A Practical Guide for Lawyers by Julia Batchelor-Smith is available on the LexisNexis NZ website. Sophie there is a real challenge for all Firms big or small in addressing this issue. However, from my observations it is a greater challenge in Large Firms due to the gender imbalance( ie. > male ) in equity partners and a increasingly out of date sense that there is a never ending pool of talent who want to join Large Firms . In boutique and smaller firms it is often lesser of an issue as this gender imbalance can be less prevalent due to the inherent demand for quality lawyers often women who are more highly valued and as such provided with conditions which ensure greater prospects for flexible work conditions. Top tier law firms do nor care about work-life balance, so this report will be like all the other mutterings from the top tier that are all about marketing and little about reality. I always laugh... having gone from a top-tier to a mid-tier to a small firm with little change in my pay rate, I can tell you know you cannot have a work-life balance when the partners have no desire trim their profits.